We provide World Cup 2015 Results and Live Scorecards: The 2015 ICC Cricket World Cup will be the 11th ICC Cricket World Cup, scheduled to be jointly hosted by Australia and New Zealand from 14 February to 29 March 2015. 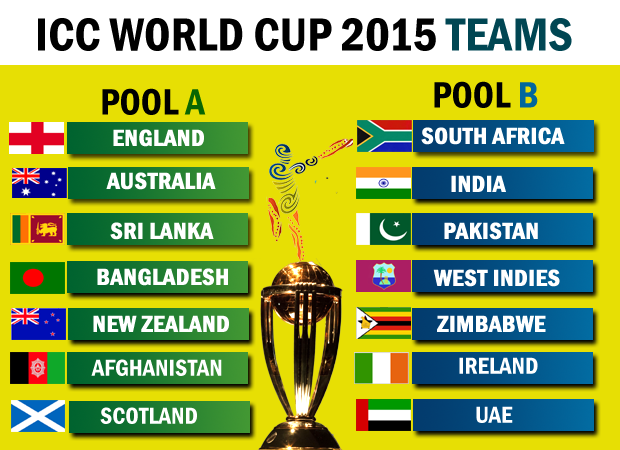 The 2015 ICC Cricket World Cup will be the 11th ICC Cricket World Cup, scheduled to be jointly hosted by Australia and New Zealand from 14 February to 29 March 2015. 49 matches will be played in 14 venues with Australia staging 26 games at grounds in Adelaide, Brisbane, Canberra, Hobart, Melbourne, Perth and Sydney while New Zealand hosts 23 games in seven cities, including Auckland, Christchurch, Dunedin, Hamilton, Napier, Nelson and Wellington. The final match of the tournament will take place at the Melbourne Cricket Ground. You can get a betfair promo code and all the fixtures for the tournament below. Total Fourteen warm-up matches are scheduled to be played from 8th to 13th February 2015.